The LANC-LN series of DC DC converters provides up to 5 watts of output power in a compact 1.25″ x 0.80″ x 0.40″ package. This series consists of single and dual output models with a 4:1 ultra wide input range. Each model in this series has over voltage, over load, and short circuit protection and is compliant to RoHS and REACH. This series has ultra-low ripple and noise as well as low standby power. The safety of this series meets UL60950-1, EN60950-1, and IEC60950-1. Please call factory for order details. (2) The standard modules meet EN55022 Class A without external components. -LANC24xxxW-LN Models: Do not need any external components. -LANC48xxxW-LN Models: Connect two 4.7µF/100V MLCCs in parallel to input pins. 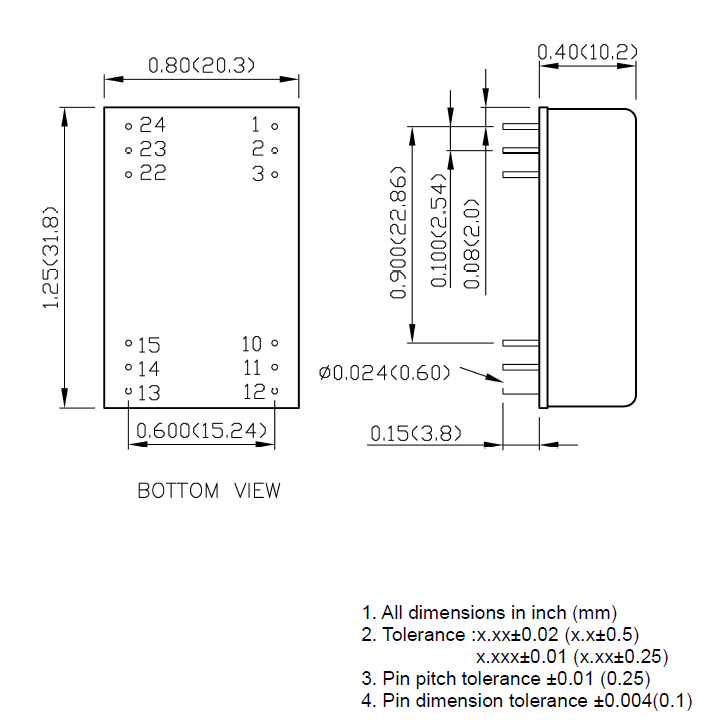 (3) An external input filter capacitor is required if the module has to meet EN61000-4-4, EN61000-4-5. 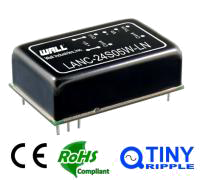 -LANC24xxxW-LN models are recommended to use an aluminum electrolytic capacitor (Nippon chemi-con KY series, 220µF/100V) and a TVS (SMDJ70A, 70V, 3000 Watt peak pulse power) to connect in parallel. -LANC48xxxW-LN Models are recommended to use an aluminum electrolytic capacitor (Nippon chemi-con KY series, 220µF/100V) and a TVS (SMDJ120A, 120V, 3000 Watt peak pulse power) to connect in parallel.